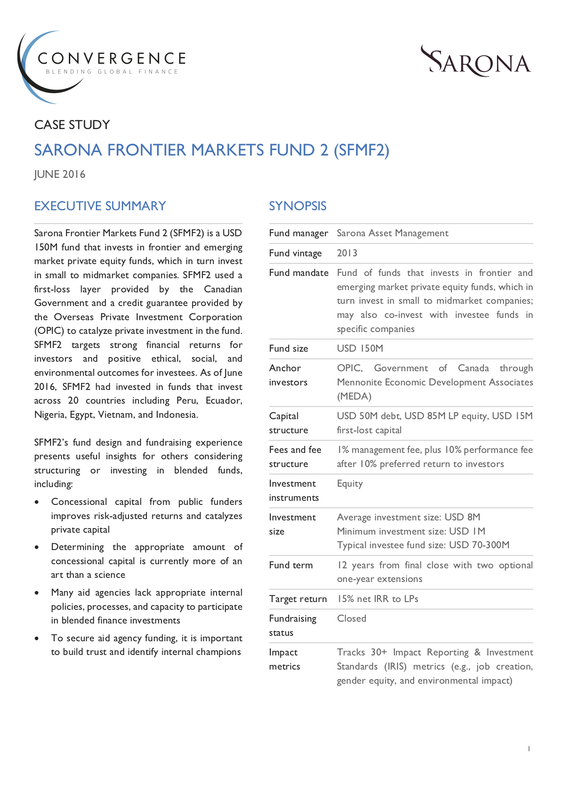 Sarona Frontier Markets Fund 2 (SFMF2) is a USD 150M fund that invests in frontier and emerging market private equity funds, which in turn invest in small to midmarket companies. SFMF2 used a first-loss layer provided by the Canadian Government and a credit guarantee provided by the Overseas Private Investment Corporation (OPIC) to catalyze private investment in the fund. SFMF2 targets strong financial returns for investors and positive ethical, social, and environmental outcomes for investees. As of June 2016, SFMF2 had invested in funds that invest across 20 countries including Peru, Ecuador, Nigeria, Egypt, Vietnam, and Indonesia. SFMF2’s fund design and fundraising experience presents useful insights for others considering structuring or investing in blended funds, including: i) Concessional capital from public funders improves risk-adjusted returns and catalyzes private capital; ii) Determining the appropriate amount of concessional capital is currently more of an art than a science; iii) Many aid agencies lack appropriate policies and processes to participate in blended finance investments; iv) To secure aid agency funding, it is important to build trust and identify internal champions.